Betty Friedan (February 4, 1921 - February 4, 2006) was an American writer, activist and feminist. She wrote the book The Feminine Mystique in 1963. She argued in the book that there was more to life for women than the achievements of their husbands and children. In an interview for Life magazine in 1963 she said "Women of the world unite! You have nothing to lose but your vacuum cleaner!" She helped set up the National Organization for Women (NOW) in 1966 and was its first president. In 1981 The Second Stage was published. In the book Friedan said that the women's movement had reached its second stage. Friedan married Carl Friedan in 1947. Friedan died on her 85th birthday. 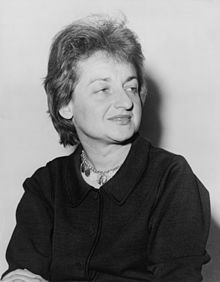 ↑ 1.0 1.1 "Betty Friedan by Truthout.org". zcommunications.org. ZCommunications. Retrieved 27 November 2010. ↑ "National Women's Hall of Fame - Women of the Hall". greatwomen.org. Retrieved 27 November 2010. ↑ "Betty Friedan, Who Ignited Cause in 'Feminine Mystique,' Dies at 85 - New York Times". nytimes.com. Retrieved 27 November 2010.